This is the drum N and L helped pull around. 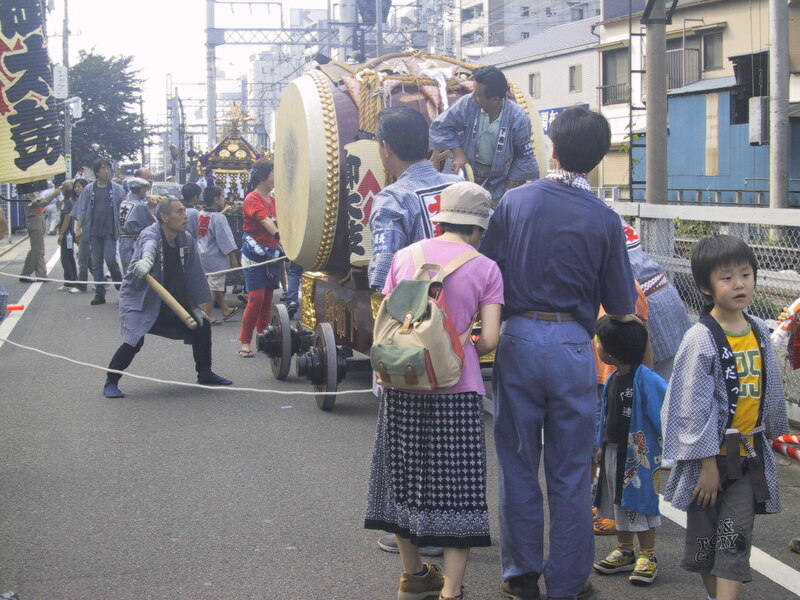 Our team's course was on both sides of the railroad tracks and it was a little harrowing getting 50 kids, the drum, the kids' shrine and the adults' shrine with 30 or 40 slightly inebriated shrine bearers in loincloths (called FUNDOSHI) across the tracks between trains. We had to do it in 2 shifts. I haven't seen these shrines move so quickly unless it was at some other more competitive festival where they bash into each other or race around the neighborhood. Our team usually just meanders along the designated route, spreading the blessing and then sprints across the tracks. I'm surpised nothing tipped over. The kids all got bags full of snacks for participating which have already been devoured two days later. Although we live in a big city, the local Shinto shrine continues their annual harvest festival. 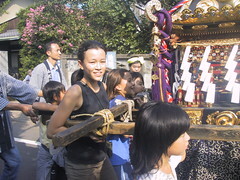 J was a little too tall to carry the childrens' portable shrine (called a MIKOSHI) so she just tagged along behind. L and N pulled a gigantic drum around the neighbor on a one mile route through the neighborhood. The main street near our house was closed all afternoon so teams of shrine bearers from other nearby neighborhoods could pull their drums and carts of musicians around and carry their shrines too. Well, it's still in the low to mid 90s (Farenheit) but Monday night I heard the hot sweet potato vendor driving around the neighborhood playing a tape over a loudspeaker, touting his stone-roasted sastuma potatoes. There is actually a wood-fueled oven filled with stones in the back of the tiny pickup truck. I guess it's time to replace the bamboo wind chimes with Autumn decor...even if it still feels like summer. I went on-line and ordered enough food for a few days to be delivered by the local supermarket this afternoon as a big typhoon of Hurricane Katherine intensity is headed toward Kyushu and it has already begun to rain in Tokyo. It looks like we'll miss the brunt of it but a tiny earthquake this morning was extra incentive to prepare a little more. I've made a 6 liter jug of the barley tea the kids like, a big batch of rice and a pot of pumpkin soup so I won't have to cook much later when everyone is home and the place gets too humid and hot from all the bodies. The bathtub is full in case we need it for flushing toilets. The kids are all at school as the weather isn't bad enough yet for a "storm day."